1636. * Charles I, full of a sense of his own importance as an absolute monarch, is ruling without Parliament; he’s attempting to get round the awkward fact that only Parliament can raise taxes by imposing the hated feudal levy called Ship Money (normally only used in wartime and only charged in coastal areas) in peacetime and across the whole country. The church is being reformed by a new Archbishop of Canterbury, William Laud, who is reducing the Calvinist influence on the church, standardizing liturgy (emphasizing the use of the Book of Common Prayer) and ordering churches to be arranged – with altar rails, and an altar raised on a platform – in a way that sharpens the focus on the altar and on the sacred rite of Holy Communion. Both these changes – the taxation, the religion – cause upset and tension. More tension, and the Civil War, are around the corner. In Axbridge, Somerset, it’s not just fittings like altar rails that are exercising the parishioners. They’re reroofing the nave of their church – and giving it an astounding ceiling quite remarkable in its network of plaster ribs and decorations. The very idea of a ceiling is, if not unusual, far from the norm in English parish churches: many make do with open roof timbers and these are often displays of virtuoso carpentry. This, on the other hand, is virtuoso plasterwork, from the hands of a local man called George Drayton. In the 1630s, plaster ceilings in grand houses often have a network of protruding ribs, frequently with pendant features where the main ribs intersect. The patterns can be intricate and dizzying to look up at, and the effect is frequently one of worldly richness.† Here, Drayton has taken this idea and adapted it, adding curves and pointed cusps that turn some of the shapes into quatrefoils. This cusping and quatrefoiling is a motif of the Middle Ages – in other words the plasterer has taken a 17th-century design and applied medieval additions to it, turning it into something that looks almost Gothic. The result, combined with the striking blue and white paintwork, is dazzling. I don’t know whether this mix of old and new styles reflects in any way the mix of old and new ideas prevalent in England at this time. Some would perhaps see the addition of Gothic into the decorative scheme as a nostalgic backward glance to the old Catholic religion that inspired medieval churches. Others might compare it to the nostalgia prevalent in the theatre of the period, which featured frequent reworkings of earlier dramatists like Shakespeare and Jonson, as if Charles I’s anxious citizens wanted their previously great country back. Or perhaps it was a more neutral preference – people just liked Gothic. Such speculations are interesting. But today we can marvel at this ceiling for its own sake, and for the pleasure in the ways that English churches, so apparently conventional and part of the establishment, can pull breathtaking tricks on us, just when we think we have them taped. * This has turned out to be a rather long post. Here’s an executive summary for those in a hurry. This is a wonderful intricate church ceiling. It was made in 1636 but incorporates design elements from 250 years earlier. There are many possible reasons for this stylistic puzzle, but we don’t need to know the answer to enjoy the effect. † Such ceilings in country houses were also often studded with images of heraldic beasts, flowers, and other decorations. There’s one from Lanhydrock on this page. The old Roman road called the Fosse Way is one of my favourite routes to the Midlands. It runs almost as straight as the proverbial die* from Cirencester up to Leicester and Lincoln (old Roman towns all), and I often join it at Stow on the Wold or Moreton in Marsh to head towards an exhibition at Compton Verney or to visit an old friend in Leicestershire. Once you’re past Moreton heading north there aren’t many villages or towns on the Fosse, and those that there are, I tend to pass by quickly. One such is Halford, which I’d registered for years as having an inn (with an archway redolent of 18th-century stables and coaches) and a few roadside houses. But the other day I decided to pull in and have a look at whatever lay beyond. I was heading for the church, but, as often when I’m heading somewhere, something else caught my eye – a group of houses around a little green, tucked away off the main road. The traveller in a hurry would never know they’re there. Here’s one, Halford House. At first glance I took it to be a Georgian house to which the porch and windows above had been added a bit later, in the Regency period. But who would make such a small addition to a house in this way? A closer look confirms that the whole thing was built in one go, in the early-19th century.† The ironwork of the balcony and the wooden door surround certainly look to be from that period, the cornice is all of a piece, and the upper string course (the horizontal band below the upper windows) runs continuously. The deep bay window and balcony are very Regency things. I’ve noticed bay windows of this period in Aldeburgh (and in many other seaside places such as Brighton). This is no coastal town, but there’s still that feeling of slightly relaxed architecture, as the fashion changed, the Georgian liking for a more restrained symmetry being replaced by something a bit less formal. If I think of it as a style about relaxation and sea views, it works equally well in a quiet village, just off the road. *The road is the A429 and the B4455. As a boy I heard older relatives reminisce about how it was a narrow, minor road north of Moreton, with gated portions where you had to stop and open gates before you could pass through. It’s very different, of course, now, but still a rural road in many places. 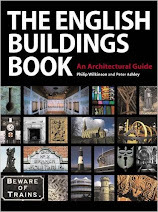 †The new Pevsner volume on Warwickshire confirms this date. 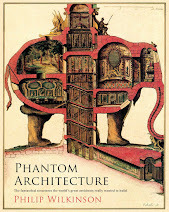 I'll be posting a review of this fine addition to the Pevsner series soon, in my winter clutch of book reviews. As the rain drizzles down in the Cotswolds, we’re apt to take for granted the regular clean water supply that we expect, in most of Europe, to be just there, at the turn of a tap. We grumble, of course, when they dig up the road to lay new water pipes, as they’re doing in my town at the moment. But our pipes have been there a while: in this town ‘the water’ was laid on in the Victorian period when the local bigwig and benefactress decided that installing piped water would be a good way to celebrate Queen Victoria’s jubilee in 1887. Many villages, such as the one where I was born in Lincolnshire, had to wait until the 1960s. Some places were more fortunate. The mysterious structure in my photograph is on the hill outside the Cotswold town of Chipping Campden. It looks rather like a village lock-up, but it’s actually a conduit house, built as part of a system of pipes that brought spring water to the town. It has, apparently, a water trough inside it – such structures marked the point where one or more pipes from springs converged and exit pipes carried the supply on to the users. There might also be a holding tank. 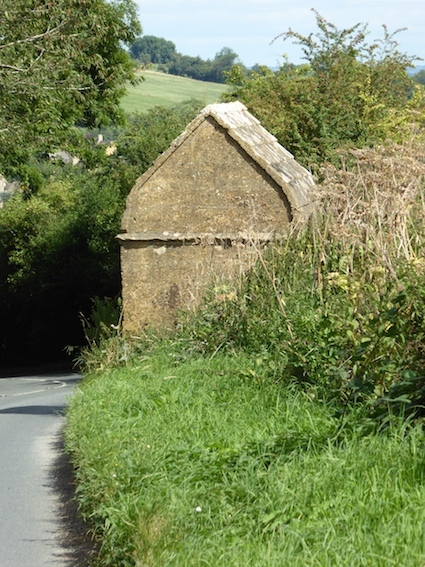 Campden’s conduit house is built, like most of the rest of the town, of Cotswold stone. The virtually windowless construction, with stone flags attached firmly to make a vaulted roof, is indeed as secure as a lock-up, and not without reason. The people who built this did not want vandals getting in, or slates blowing off so that the supply could be contaminated. So it’s built to last, and its builders of c 1612 seem to have known what they were doing. It certainly proved durable, staying in use until the early-20th century. The water supply it served was the gift of another benefactor, Campden’s generous and aqueously named Sir Baptist Hicks, to whom the town is variously and continuously thankful. 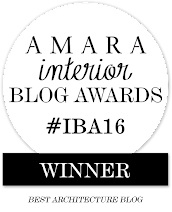 It is my great pleasure to announce, to my utter astonishment, that this blog has won the Amara Award for Best Architecture Blog, for the second year running. This is indeed an accolade, and I want to thank the people who nominated the blog, all the friends who voted for it – thereby ensuring that it got on to the shortlist – and the judges who finally whittled that list down to a single winner. As it was last year, the awards ceremony at the Ham Yard Hotel in London was highly enjoyable, with gracious hosting from Amara, many smiles and much appreciation from Sophie Robinson, who presented the awards, generous support from the sponsors (special thanks to Umbra, sponsors of my award) and a large crowd of enthusiastic people, including some fans of English Buildings. There was much to take away from this occasion, not least the sense that there are a lot of people with interesting and engaging blogs in the world of interior design and that they blog because they love what they do and want to share designs, ideas, colours, objects, etc, etc, with the rest of us. And all of this is very positive – this is people telling others what they like, with the hope that they will like it too. The list of winners in all the different categories is here. Corn Street is the heart of old commercial Bristol. It’s where the Exchange is, and it’s full of old bank buildings and the offices or former offices of insurance companies. Some of the buildings have statuary celebrating Bristol’s roots in exploration and trade (I’ve posted one staggeringly ornamental bank building before*). Here’s another of these mercantile structures, the Commercial Rooms, built in 1809–11 as a club for merchants. 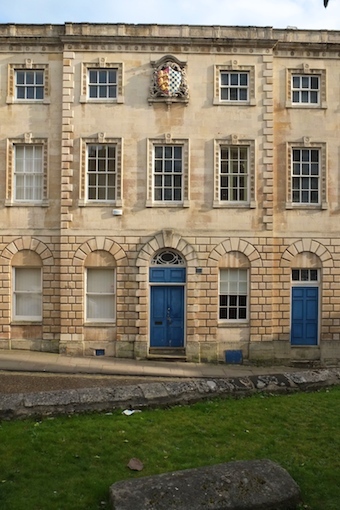 The façade can certainly hold its own – the big Ionic portico and side windows hark back to the Palladian proportions of the previous century.† However, the Commercial Rooms’ impact comes just as much from the sculpture – the three figures at the top are personifications of Commerce, Navigation, and the city of Bristol itself. Inside, there’s a big room with a very striking domed ceiling. This consists of a shallow dome at the top, raised on slender caryatids (in between which are glazed panels), themselves supported on pendentives. The pendentives are the triangular bits that enable the circular dome to fit on top of a square aperture. It’s altogether an elegant design, lending the interior both grandeur and light. I imagine it would originally have been painted in more restrained colours, pastel shades perhaps. The Commercial Rooms is no longer a club for merchants.§ It’s a pub now, and all can enjoy its striking interior. I’m glad I had a look inside. †The Pevsner city guide to Bristol notes that the architect, C A Busby, drew on a couple of slightly earlier buildings (the Liverpool Lyceum, 1802 and the Manchester Portico Library, 1802–6) for some of these effects – the library certainly has a big portico and a domed ceiling inside. The guide points to Sir John Soane’s domed Consols Transfer Office in the Bank of England (1798–9) as one source for the interior dome. § It’s now a Wetherspoon’s and there’s more information here. Facebook reminded me today that one year ago I went to the excellent Ai Weiwei exhibition in London’s Royal Academy, an occasion that not only left me with enduring memories of the art, but also gave me reason to notice the very old telephone box in the entrance to the RA’s building, Burlington House. Looking back through my pictures, I notice that I also have an image* of the wooden post box under the Burlington House entrance arch.† This is all that remains of the Post Office that was once in a room to one side of the entrance arch. The Post Office closed as long ago as 1940, and this box is a reminder that in the 19th century, post boxes were far from standard in form. Big cast-iron monster boxes, pillar boxes like Doric columns, and the elegant hexagonal Penfold boxes§ were all around in the 19th century, along with various other forms, and some of these old ones have still not been replaced with newer designs, much to our visual benefit. For Burlington House, with its classical forms and intricate Renaissance revival ornament (see the left and right edges of the picture), something still more different was fitting. So this very formal wooden box is complete with classical pediment, in which a carved crown is set amid scrollwork. Beneath, there are two slots, which are now marked ‘Franked Mail’ and ‘Stamped Mail’. Above the plate saying ‘Stamped Mail’ one can just discern part of the word ‘London’ beneath – originally these two slots would have been for letters to London and elsewhere respectively. I have a hunch, and it’s only that, that the shape of this bespoke wooden box has a practical raison d’être. Not only is it made to fit neatly in the available wall space between the pilasters but it’s also not very deep (and wall-mounted, so that it does not occupy floor space). This is not a wide passage and it can get busy. Plonking a ready-made letterbox here just wouldn’t have been very convenient. Altogether, it’s an elegant solution. * My photograph contains a blurred figure walking quickly into the frame. I doubt if this figure is recognisable, but if you do recognise yourself and would rather not have your image online, please contact me using the ‘comment’ button below, and I will remove the picture. † The sign above the box reminds us that the Linnean Society, Britain’s learned society concerning itself with biological sciences, is based in rooms above the entrance arch to Burlington House. § I plan to post more about Penfold boxes soon; 2016 is the year of the Penfold’s 150th anniversary. The Resident Wise Woman is a great one for coming home from the shops with bargains, and she is in the habit of including in her bargain baskets a few of what the supermarket is offering in the way of bottled beers. They’re an interesting lot, too, ranging from the products of microbreweries I’ve never heard of to beers from stalwarts such as Shepherd Neame, Martson’s, and Adnams. I am, as regular readers will know, a sucker for buildings that turn a corner memorably and there are few corner shops that do so as memorably as this one. It’s not just the curving window, nor the neat Doric pilasters that frame the doorway, nor even the way that the line of the pavement echoes the curve of the window. It’s also the lettering of the sign – gold, standing out against its red background, with pleasant proportions and pretty good spacing. I can even live with the fact that the comma in ‘Ltd.,’ is rather eccentrically lying on its side and that part of the leg of one of the Rs is broken. It’s all part of the character of this very characterful facade. Cheers! 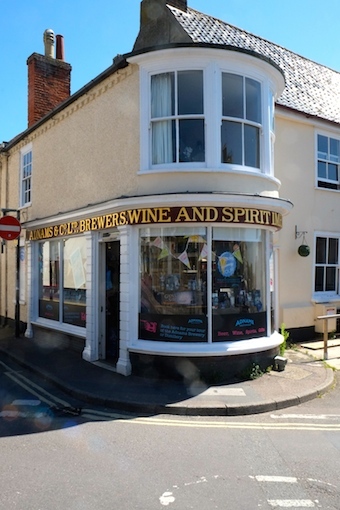 * It’s actually Adnams wine shop, and adjoins the Red Lion pub. 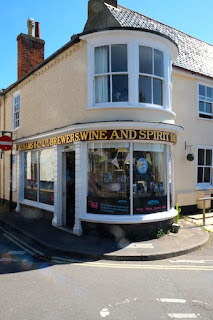 Adnams also has a newer shop elsewhere in the town. There’s more on Adnams stores here. † I was first alerted to this shop front by seeing a picture of it in one of the beautiful pocket books that Peter Ashley did for English Heritage some years ago. The book is Local Heroes: Pubs and Inns (2001). I’m endlessly fascinated by the ability of the late Victorians to produce buildings that, while basically in a revivalist style, exude decorative added value. They had lots of different ways of doing this, using styles from Gothic to Jacobean revival, as well as a whole range of different versions of classicism – plus extra decorative bells and whistles that buildings in these styles would’t have included. Here’s a highly ornamental late-Victorian building, but one in an unusual style: a sort of northern Renaissance, with Dutch stepped gable (and what a stepped gable), scrolls, terracotta panels, and obelisk finial – not to mention a variety of window types to enliven the frontage and no doubt the interiors too. It’s the sort of thing you’d see on the main square of a Dutch Renaissance town – Haarlem, suggests Pevsner – and even among a host of neighbouring stepped gables it would stand out. The design was by Frank Verity and when it was finished in 1900 it housed the French Club, before being taken over by the film company Pathé, before, in 1935 it became St John’s Hospital for Diseases of the Skin. The idea of this hospital was that regular clinics were provided discreetly where members of the ‘artisan class’ could attend without it being obvious (once they’d made it through the door, presumably) that they had an embarrassing skin disease. By the 1930s the skin specialists had outgrown their premises in Leicester Square (they were treating around 1,000 outpatients a week) and had this building in Lisle Street converted for their needs. They remained here and in adjoining buildings until moving to the St Thomas’s Hospital complex in the 1980s. At that point the lower part of the building became a pub, the Crooked Surgeon, later becoming a Slug and Lettuce. If this feels a step down, no doubt the hospital gains from its site at St Thomas’s, and the wonderful facade remains. And it still does something (pleasurable, absolutely) to the skin at the back of my neck as I pass. Last week brought the news that the Churches Conservation Trust has taken on its 350th church. The Trust is an excellent charity that takes over and looks after church buildings that can no longer be maintained by their local parishes. The churches are all of outstanding architectural and/or historical interest and the Trust opens them to the public and sells guidebooks and provides other information about them – but the buildings are still churches and occasional services are still held in them. I’ve noticed, and praised, their work before on this blog and I am just one of a legion of enthusiasts and supporters. 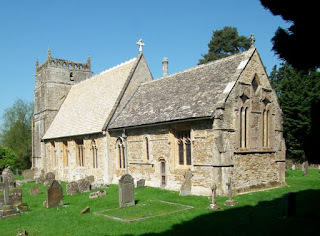 The 350th church on the Trust’s list is St Kenelm’s, Sapperton, Gloucestershire. * It’s a beauty – for its exterior, with its lovely little spire (far from the norm in this county, where most churches have towers) and its lovely setting, and for its contents. It is a medieval church, but one much altered in the Georgian period with the addition of a number of large round-headed clear-glazed windows, which flood light into the nave. Inside are two outstanding monuments – a 17th-century one to Sir Henry and Lady Poole and an 18th-century one to Sir Robert Atykyns, the first historian of the county of Gloucestershire. The place would be worth a visit for these two monuments alone, but what sets the church apart still more is the woodwork – the most extraordinary set of Jacobean pew-ends, together with a gallery front, a big wall of oak panelling, and other pieces. This rich 17th-century carpentry came from nearby Sapperton Manor and was given to the church by the 1st Earl Bathurst† when the house was demolished in 1730. It’s secular woodwork that has been repurposed, then, and the pew ends certainly look secular in origin – each one bears a vigorously carved supporter figure bearing on the head a capital: a sort of Jacobean version of a caryatid or Atlas figure. The males have satyric beards and the few females bare breasts and necklaces, so they might have been even more at home in the dinging room of the manor house. But these figures have plenty of character – the chiselled beards and almond eyes, the little locks of hair – so that, stylised as they are, they’re an asset to the place. The modest capitals don’t really conform to the standard classical orders: they could be Ionic with a bit of extra foliage, or cut-down Corinthian. But they’re fun too and the whole lot make the church very special. You’d have to go a long way to find any pew ends quite like these. * Sapperton church’s page on the CCT website is here. 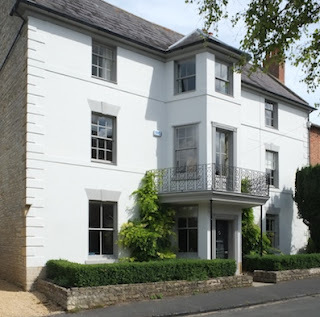 † The Bathurst who was the recipient of Pope’s famous poetical epistle, and who created the great park next to his house at Cirencester, a stone’s throw from Sapperton. ¶ I've posted about quite a few CCT churches over the years, but there are a couple of my particular favourites here and here. I have recently been watching an old television series called Six English Towns, written and presented by the architectural historian Alec Clifton-Taylor. This was a formative series for me when it first came out in the 1970s – it must have been one of the first things that made me look closely at the buildings around me. * It’s wonderful that these old programmes are available again, and I intended to say more about them. Clifton-Taylor covers some of my favourite towns, and a lot of the buildings he describes are still there. Stamford in Lincolnshire is a particular favourite: a limestone town of extraordinary grace, once on the busy A1 road but now bypassed – and still bustling and thriving in spite of now standing to one side of this arterial north-south route. Clifton-Taylor says a lot about stone, and a lot about the Georgian houses and other buildings in Stamford built of this material. One thing he noticed was the number of variations on the carved keystones above windows: the town really is an exhibition of the art of the keystone carver. 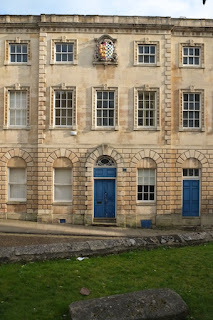 Looking through my own photographs, one example struck me in particular: Stamford’s Town Hall, a building of the 1770s. At first glance, this building, with its rows of sash windows, its rusticated ground floor, its low-pitched roof hidden behind a parapet, could be a grand Georgian town house. But the coat of arms at the top gives it away. The architect isn’t known fort certain but it may have been Henry Tatam, a local cabinet-maker who also designed buildings. The window surrounds (detail at the top of this post) don’t protrude very much, although the lasts-afternoon sun that shone when I took my photograph does its best to catch the surface variations on the facade. The sun also catches the decoration around the upper windows – the pattern of rosettes and linear forms that give these windows their elegant character. This pattern is taken up in both the keystones and the cornice, giving the decorative scheme its character – a sense of unity or repetitiveness, as you wish. The walls themselves, with their very tightly jointed stonework of the kind common in Stamford, set all this off well. Clifton-Taylor mentions this building in his film, and shows many others, often just as interesting. His programmes are good old-fashioned TV† – no gimmicks, just a man talking about what he likes for half an hour in an informative way – and well worth watching. *There were a further two series, so he covered 18 towns in all, and he brought out books to accompany each series too. †Very much of their time, these programmes show a middle-class, rather schoolmasterly Englishman unglamorously talking to camera – and showing off the buildings he discusses with relevant, informative footage. The sort of thing that’s sneered at too often as paternalistic, like Kenneth Clark’s Civilisation (another formative series for me). One shouldn’t let prejudice get in the way of their genuine insights.